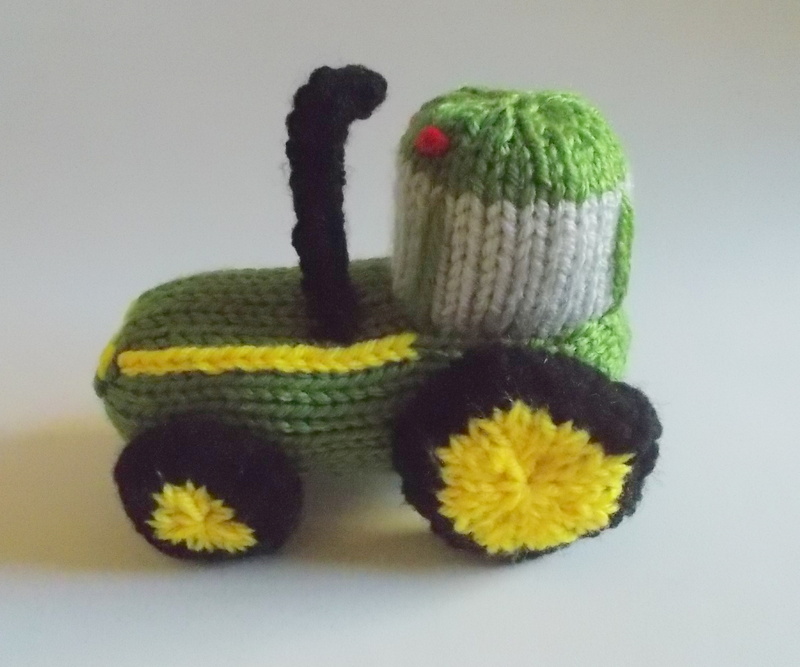 Free Pattern Fridays – Knitted Tractor Toy! 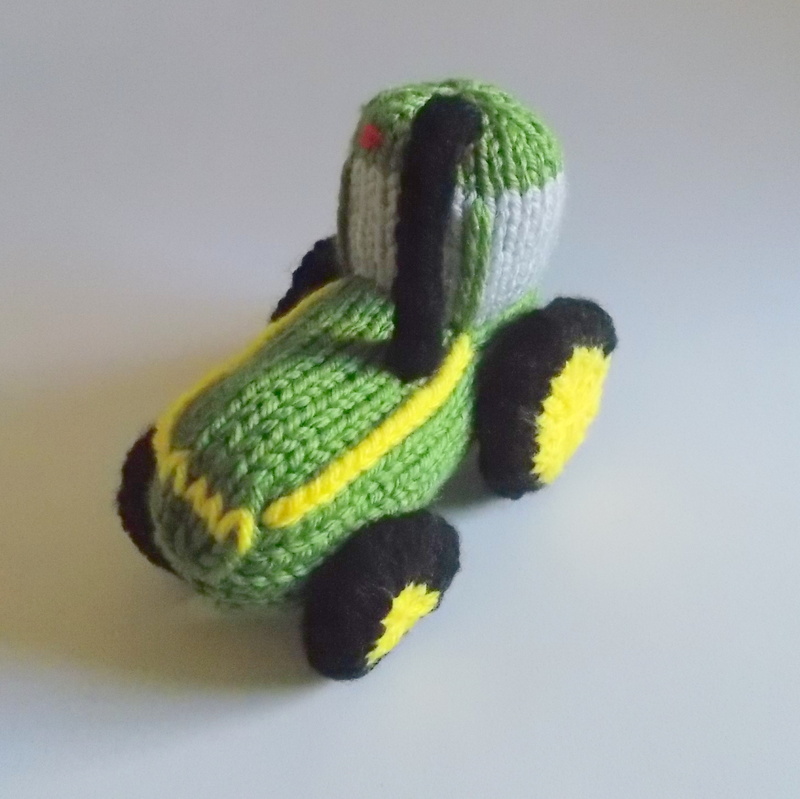 I thought I’d do another vehicle pattern this week! Tractors seem to be having their “moment in the sun,” if you will. The last time I was in the toy store, I saw several die-cast tractor toys sharing space with the other Hot Wheels/Matchbox cars. The image searches I did while devising this pattern brought up many pictures of people restoring old tractors. It also showed me how far tractor technology has come with all kinds of new attachments, body designs and innovations. I’ve chosen to keep this design more in the classic vein, though. 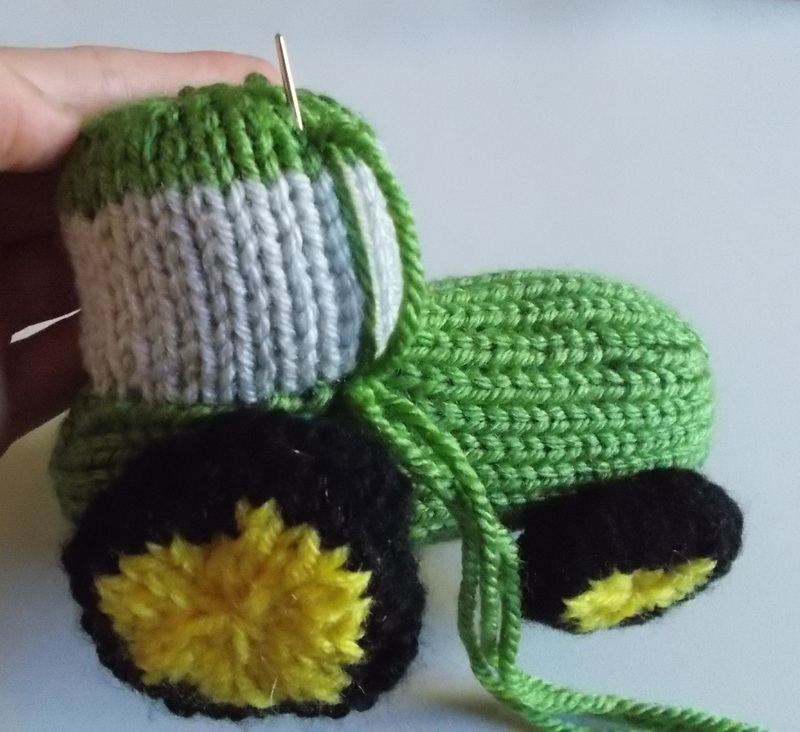 The green and yellow colors of a John Deere tractor are, of course, iconic – but that doesn’t mean you have to use those colors. If you want to make a hot pink tractor, I’m all for that! 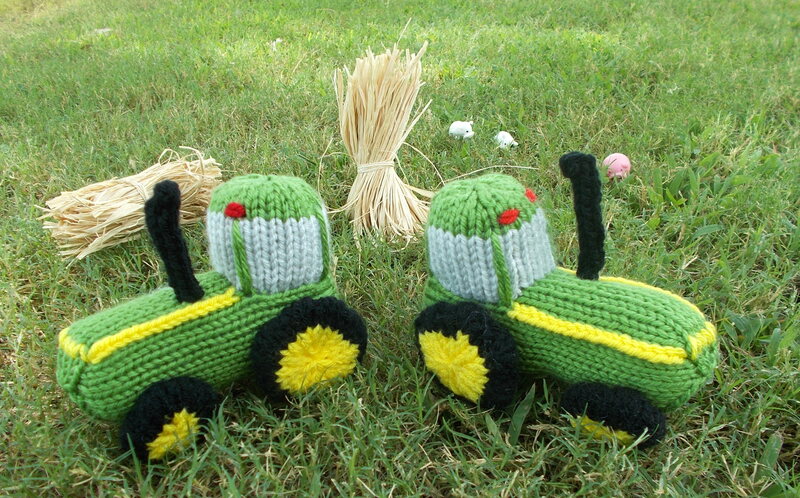 I think your kids would have a blast creating a farm scene around their new tractor! Add some toy animals and perhaps an unfinished wooden birdhouse dolled up to look like a barn … maybe some toilet paper roll silos. In my simple scenes, I bundled up some raffia to look like bales of hay or sheaves of wheat. Let your imagination run wild! 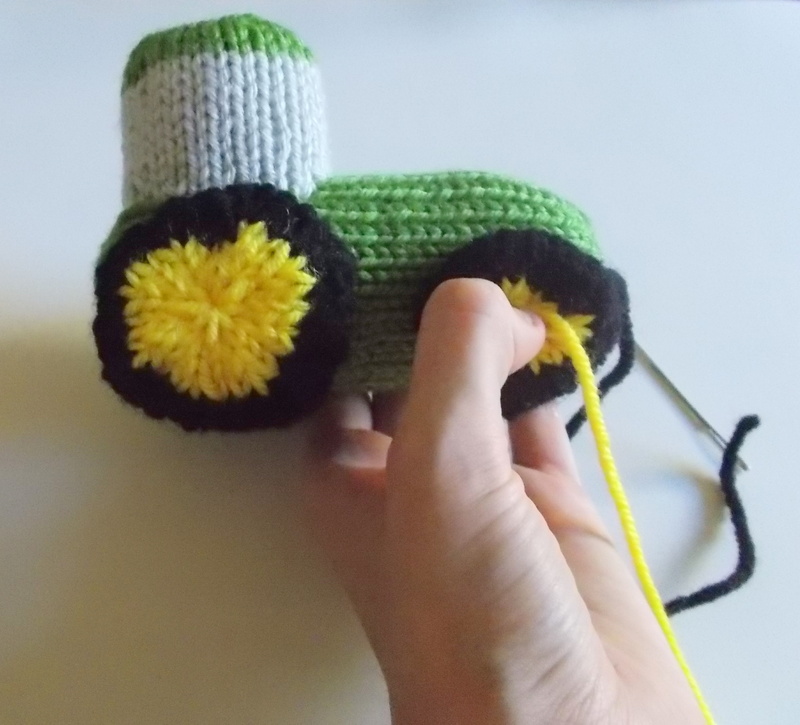 When knitted with worsted weight yarn, the tractor measures about 5 inches long. 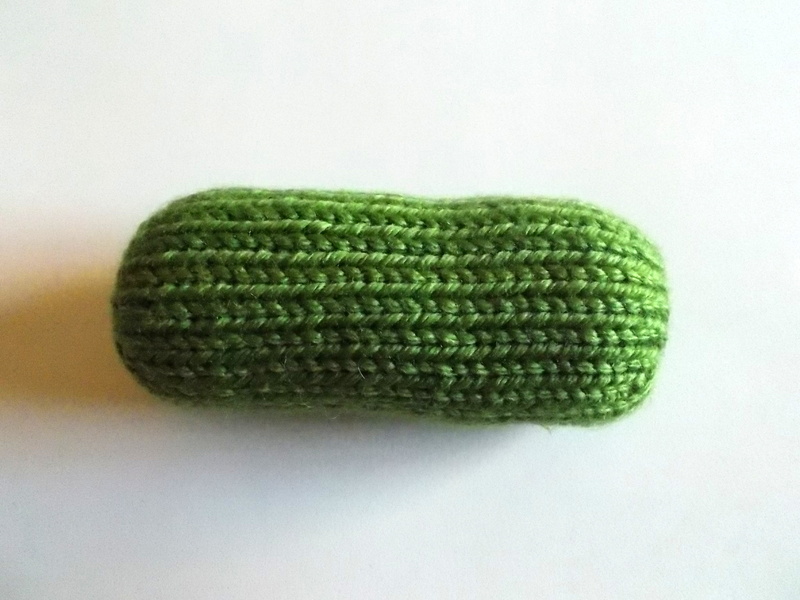 Using Green Yarn, cast on 4 stitches onto one dpn. Work the first round as for i-cord. 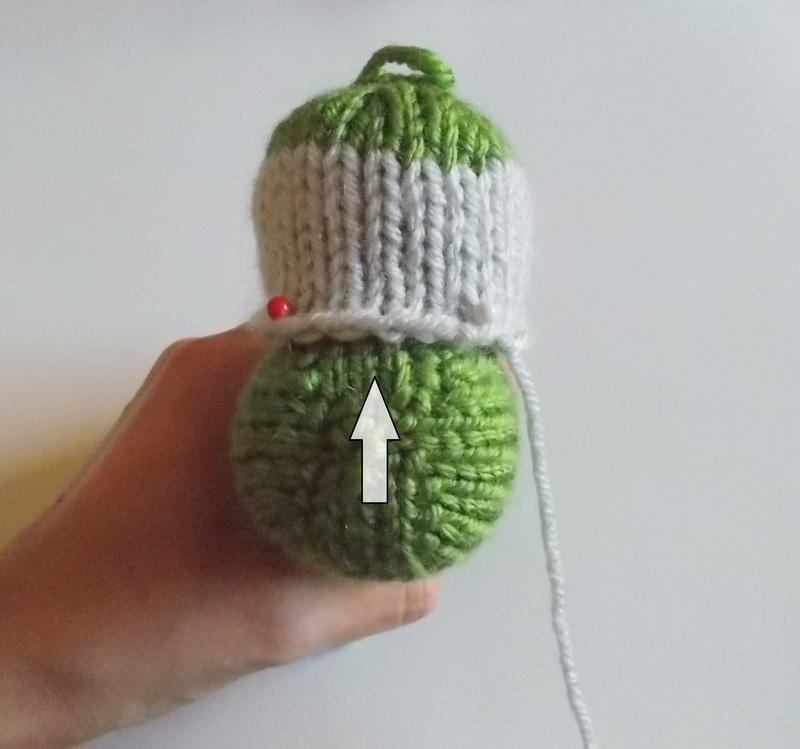 -Distribute the stitches onto 3 dpns and proceed to knit in the round. Rnd 6-35: Knit 30 rounds. -Add some additional stuffing to the front of the body if necessary. Cut the yarn, thread the tail into a tapestry needle and weave through all stitches on the needles, pulling tightly to close. -With the tail still on the tapestry needle, thread it down into the now-closed hole and into the body, pulling tightly to flatten out the front end. Weave it through the body a few more times to secure. -Weave in the cast on tail at the rear end. 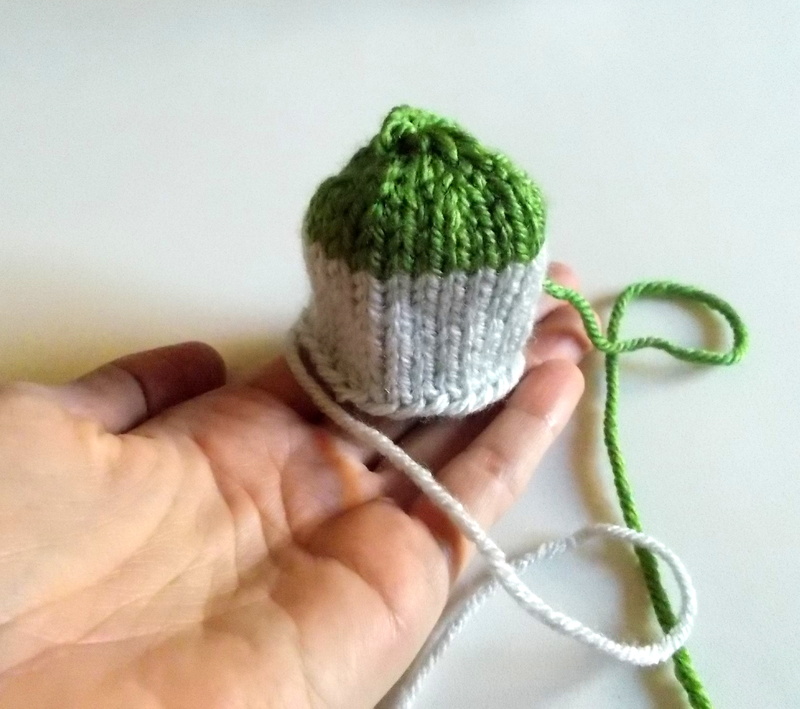 Using Light Gray Yarn and leaving a tail for seaming, cast on 24 stitches onto 3 dpns and join to knit in the round. Rnd 1-8: Knit 8 rounds. 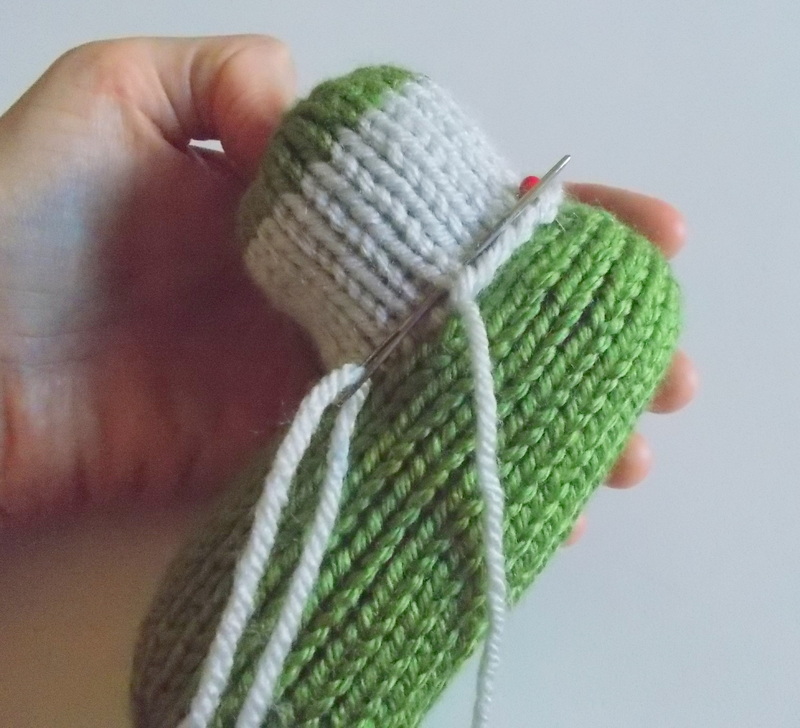 -Join in the Green Yarn, cutting the Light Gray Yarn. 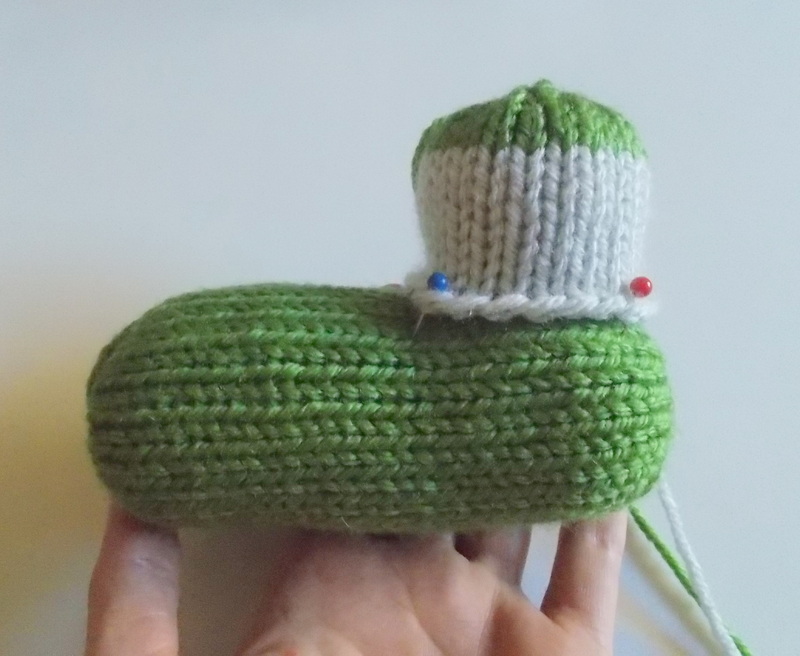 Proceed to knit with Green. Rnd 9-12: Knit 4 rounds. Rnd 14: Knit 1 round. 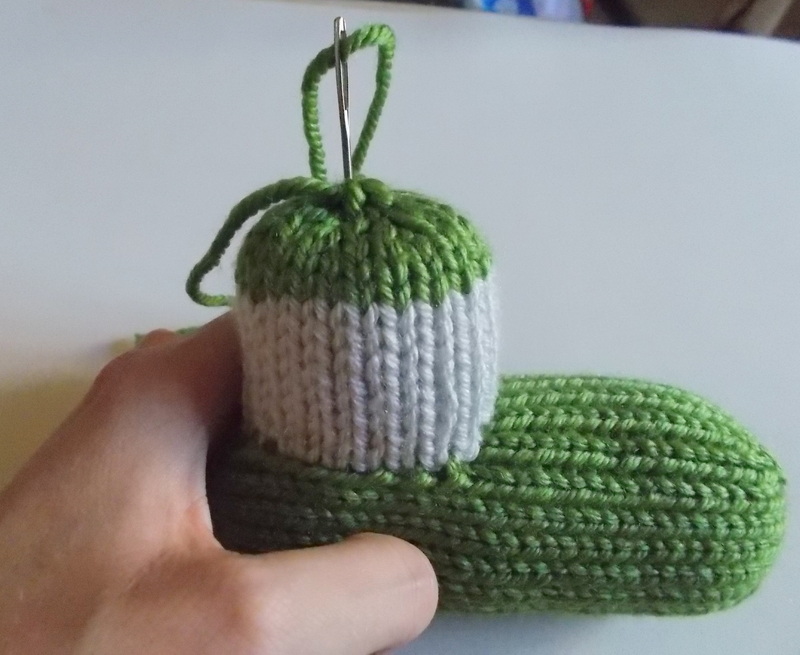 Cut the green yarn, thread the tail into a tapestry needle and weave through all stitches on the needles, pulling tightly to close. -Stuff the cab through the open cast-on edge. -Position the cab on the top rear of the body. You’ll notice that there are seams running along the back of the body which create 4 “sections” of stitches. Two of these sections are narrow, two are wide. Align the cab along one of those narrow sections. -Pin the cab in place so that it’s squared-off. -Using the cast-on tail from the cab, stitch the cab to the body using mattress stitch, adding additional stuffing as necessary before closing the seam. -Thread the green closing tail at the top of the cab into a tapestry needle and weave it down through the closed-up hole, pulling tightly to flatten out the top of the cab before weaving it through the cab a few more times to secure. 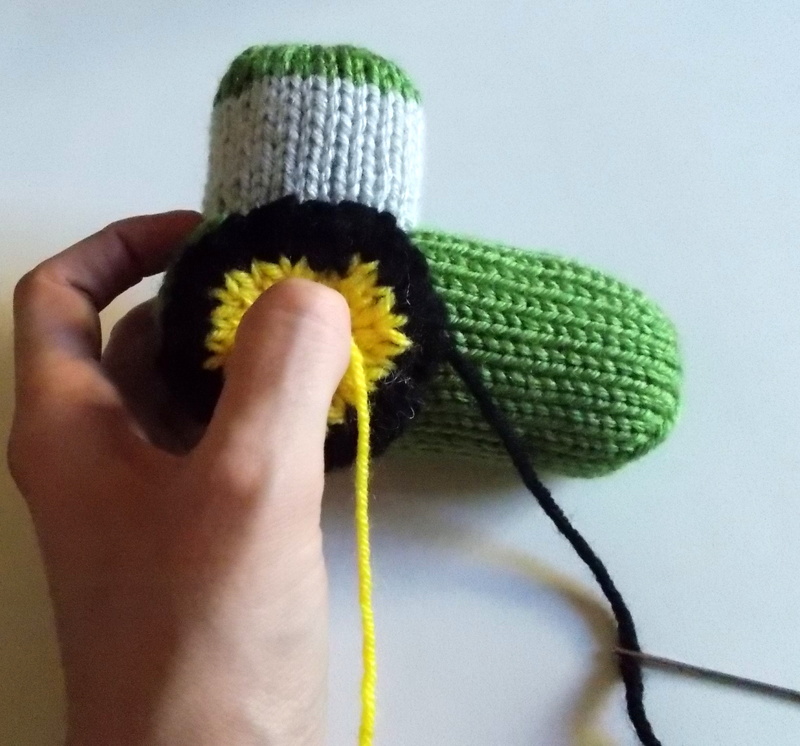 Using Black Yarn and leaving a tail for seaming, cast on 8 stitches onto 3 dpns and join to knit in the round. Rnd 6-7: Knit 2 rounds. 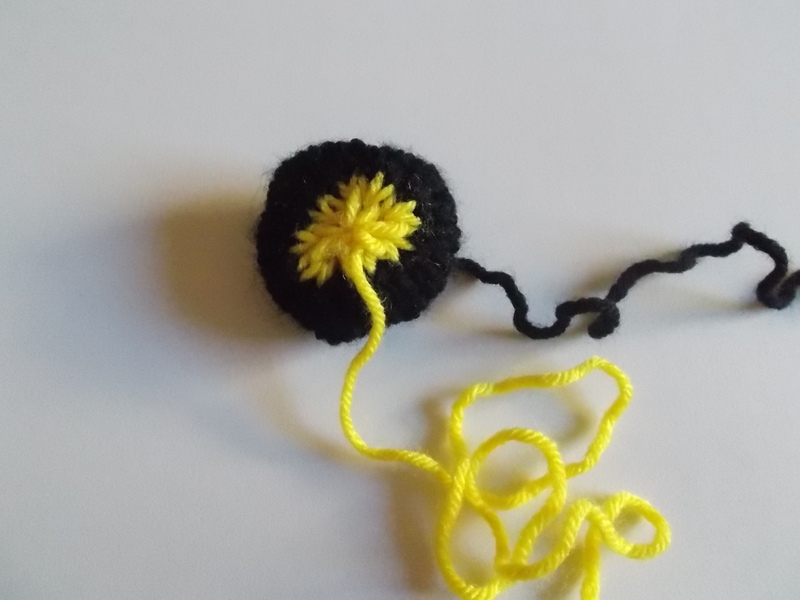 -Join in the Yellow Yarn, cutting the black yarn. 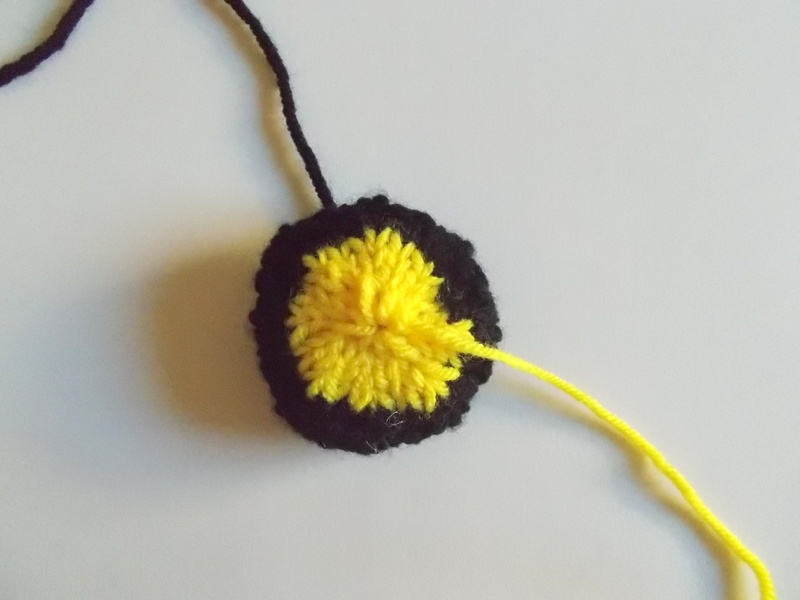 Proceed to knit with Yellow. Rnd 9: Knit 1 round. Rnd 11: Knit 1 round. -Cut the Yellow Yarn, thread the tail into a tapestry needle and weave it through all stitches on the needles, pulling tightly to close. -Repeat to make a second wheel. -Press the wheel flat, with the yellow “hubcap” on the front. -Align the wheel just below the cab on the tractor body, again making sure that the yellow area is centered and facing outward. 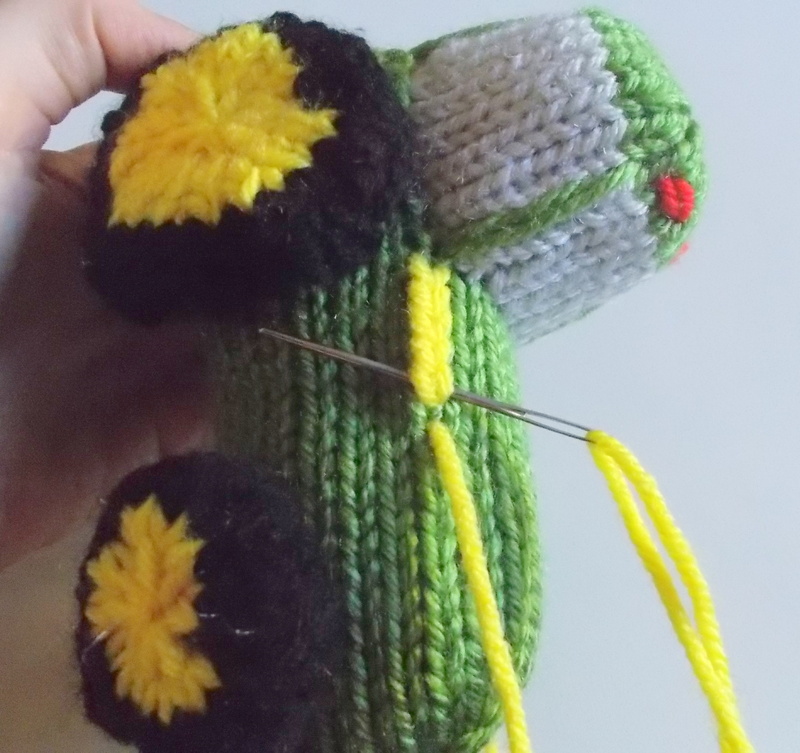 -Using the cast-on tail, stitch the wheel to the tractor body with a few stitches, then weave in the tail. -Thread the yellow wheel closing tail into a tapestry needle and insert it into the closed-up center of the wheel and into the body, pulling tightly. This helps to flatten out the wheel and keep it firmly attached to the body. Weave this tail through the body a few more times to secure. -Repeat to attach the second wheel, on the opposite side of the body. Rnd 4-5: Knit 2 rounds. Rnd 7: Knit 1 round. 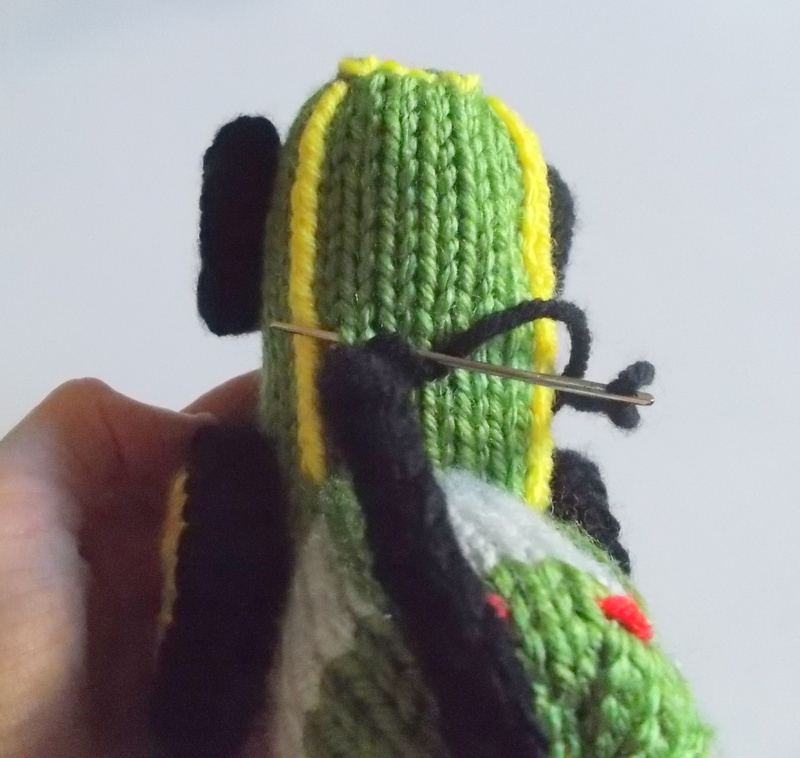 -Cut the Yellow Yarn and thread the tail into a tapestry needle. 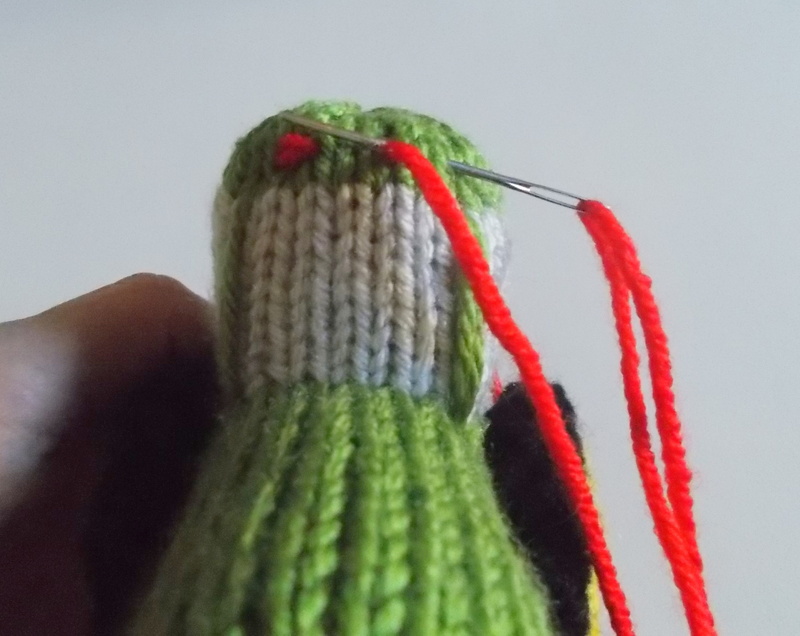 Weave the tail through all stitches on the needles, pulling tightly to secure. -Press the wheel piece flat, with the yellow “hubcap” facing outward. -Position the wheel at the front end of the body, in line with the back wheels. To ensure that the finished toy will stand level, make sure that the bottom edge of the front wheel aligns with the bottom edge of the back wheels. This means that the point of attachment of the front wheels will be lower on the body than it was on the back wheels. Again, make sure that the yellow area is facing outward and centered on the wheel. 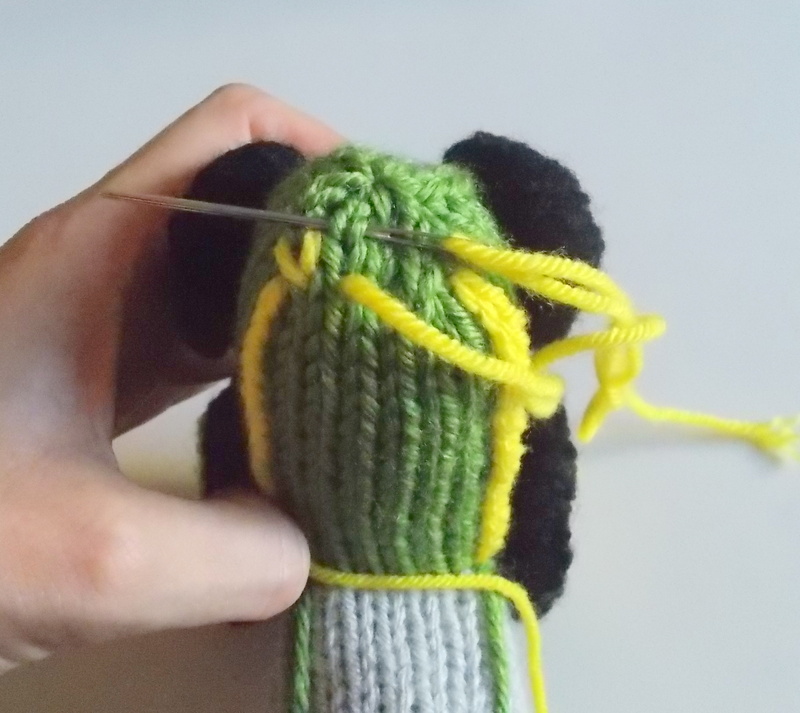 -Using the cast-on tail, seam the front wheel to the body with a few stitches before weaving in the end. -As for the back wheels, thread the yellow closing tail into a tapestry needle and weave it down through the center of the wheel and into the body, pulling tightly to flatten. Weave the tail through the body a few more times to secure. -Repeat to attach the second front wheel on the opposite side of the body. 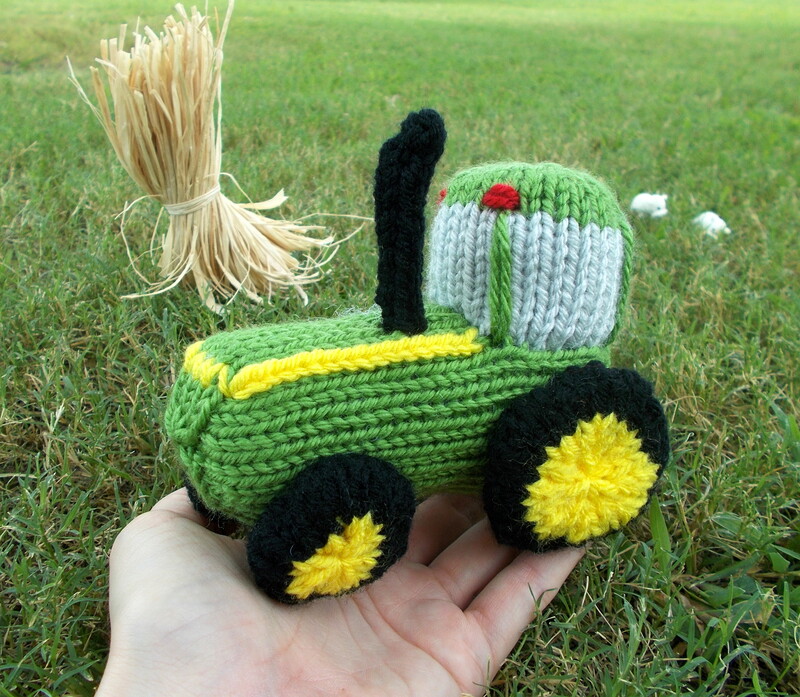 -Using a scrap of green yarn, make several long straight stitches at the 4 corners of the cab to create the windows. -Using a scrap of Red or Orange Yarn, make two sets of small straight stitches to create the cab lights. 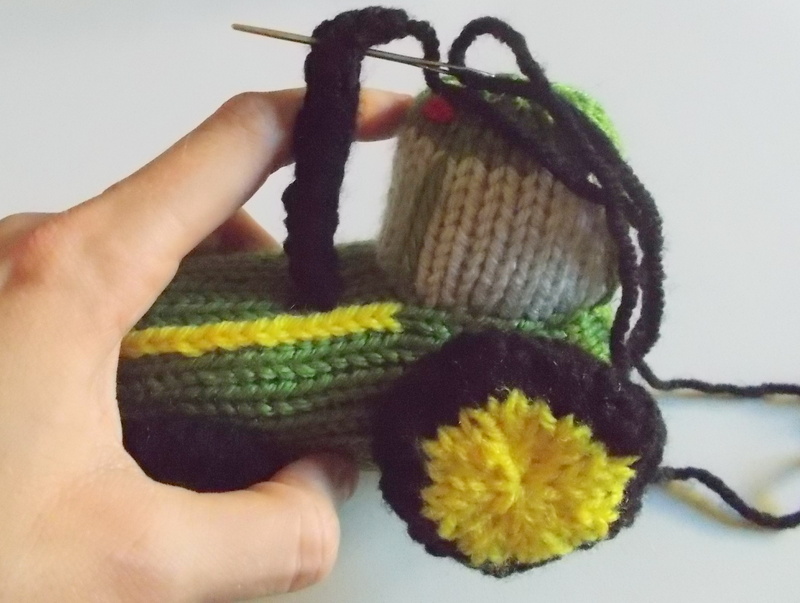 -(Optional – if you want a real “John Deere” style tractor): Using a scrap of Yellow Yarn, create two lines of duplicate stitches along the front top edges of the tractor, curving around to meet each other at the front of the toy. Using Black Yarn and leaving a tail for seaming, cast on 3 stitches onto one dpn to knit as i-cord. Rnd 1-12: Knit 12 rounds of i-cord. -Cut the Black Yarn, thread the tail into a tapestry needle and weave through the 2 stitches on the needles, pulling tightly to close. 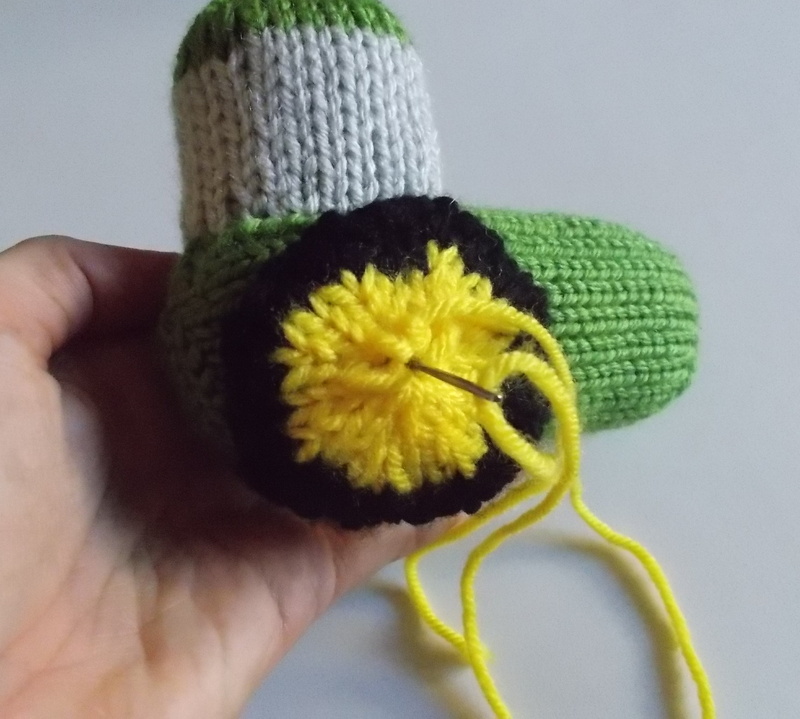 -Thread the cast-on tail into a tapestry needle and attach the exhaust pipe in front of the cab and near the top edge of the toy using a few stitches. Weave in the end. -Thread the closing tail into a tapestry needle, and make a stitch to bend the top of the pipe, then weave the tail down through the rest of the pipe and into the body. Weave the tail a few more times through the body to secure. 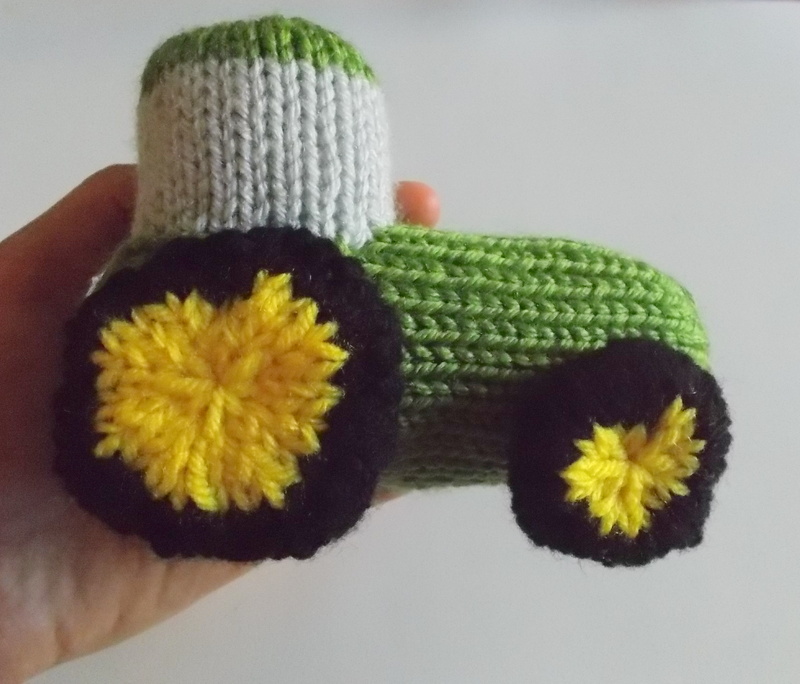 The tractor is finished! Enjoy! 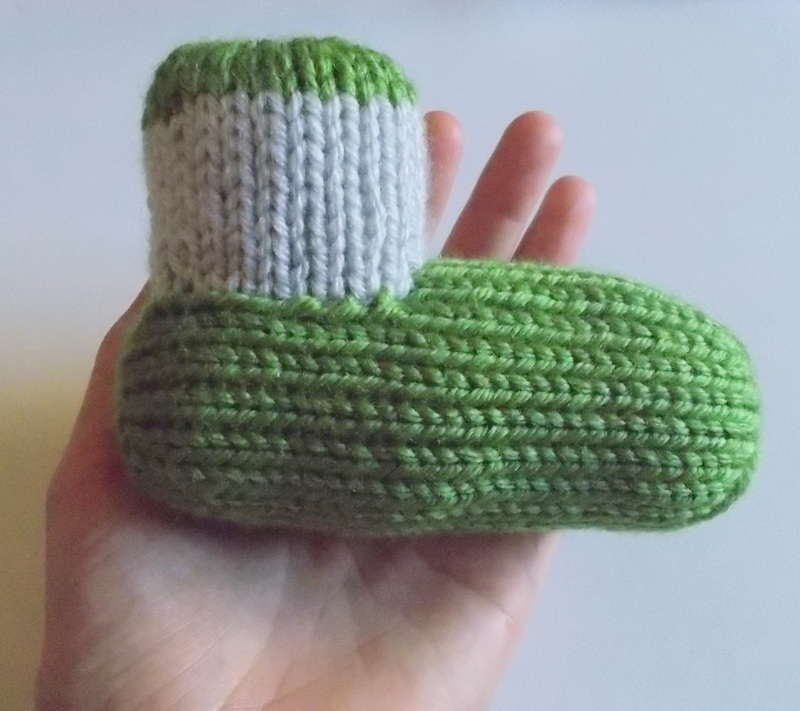 I hope you enjoyed this week’s free pattern! If you’re on Flickr, I’d like to remind you about the new DrFrankKnits group I’ve created. Visit http://www.flickr.com/groups/drfrankknits to join! It’s free and everyone is welcome! 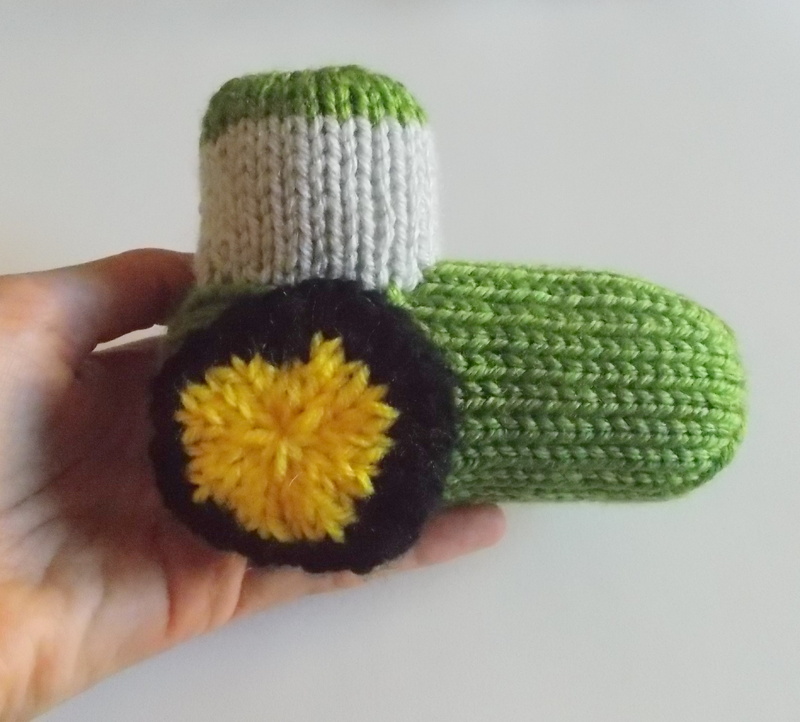 If you create a cute farm scene with this pattern, Flickr is a great place to show it off! And don’t worry – you don’t have to be a great photographer to come and share! Have a wonderful weekend and happy knitting!